Several parents who have been through the guardianship process discuss their thoughts about the appropriateness of getting guardianship for their children. Amy Severson’s daughter Nellie is a few months away from turning 18. Nellie, who is afflicted by a rare chromosomal disorder called Cri du Chat (CDC), has a developmental disability and communication challenges. Like any well-informed parent of a child with special needs, Amy knew that the issue of guardianship must be addressed a few months before your child turns 18. So, several months prior to Nellie’s birthday, Amy began looking into guardianship options. A researcher by nature, Amy spoke with several people in her New York community who she believed were knowledgeable about guardianship. Amy was surprised when an employee of a local ARC facility advised her to get a psych evaluation for Nellie to see if guardianship was even appropriate. 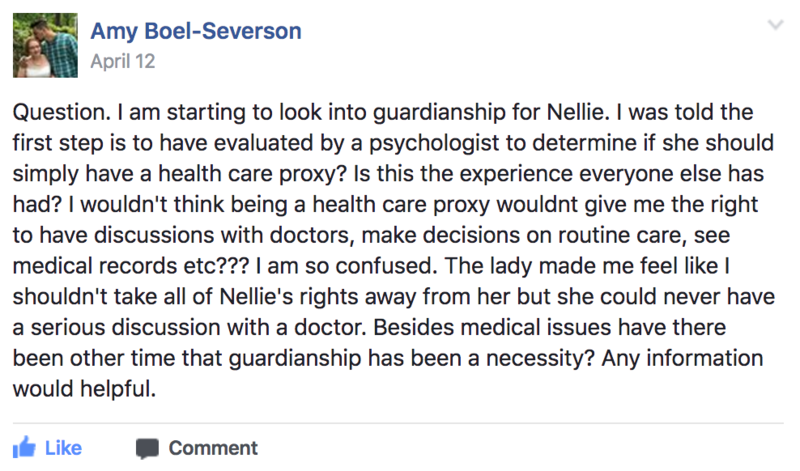 The ARC staffer suggested that guardianship would “take away all of Nellie’s rights” and that Nellie’s needs could possibly be met with a simple health care proxy. This was unexpected advice and undermined Amy’s confidence in moving forward with the guardianship. 2. What’s the best way to obtain guardianship if that’s the route you decide to take? I interviewed several parents who have been through the guardianship process (and those currently going through the process) to learn more. Once someone turns 18, by law, the authority to make major life decisions transfers from the parents to the individual. At 18 you can, among other things, refuse or consent to medical treatment, enter into contracts or take on financial obligations. People with intellectual and developmental disabilities may not have the capacity to make these decisions on their own, particularly if they have communication challenges, have problem-solving deficits or are highly suggestible. Guardianship is a judicial mechanism in which a court makes a legal determination that a person, who is over the age of 18, is unable to make these decisions on their own, and authorizes a different person to have the legal authority to make these decisions on the behalf of the person who is the subject of the guardianship. For parents of kids with CDC, guardianship is often simply a restoration of the same rights they had prior to their child turning 18. Why do parents seek guardianship over their CDC children? Safety was the primary reason the parents gave for seeking guardianship. For Ohio mom Laura Bruns, there was no hesitation about getting guardianship for her daughter Beth, who is now 23. Laura was involved in her local ARC and attended several guardianship workshops. She also had a family member who had children with disabilities, and saw what some of the legal ramifications were by not getting guardianship. Beth, who is nonverbal, was starting to go out in the world without her mom. Laura was concerned that Beth could be accused of consenting to activity that she did not have the capacity to make. California mom and 5P- Society Executive Director Laura Castillo, initially put off the decision to obtain guardianship over her adult daughter Katie, who is now 30. But an incident with a door-to-door magazine salesperson influenced her decision to move forward with it. Shortly after Katie turned 18, Laura’s aunt, who is a paralegal, completed the paperwork to file for guardianship. But like many parents, lack of time and one more expense to bear delayed things. “Probably the reason I put it off for so long was because Katie could talk, so she could say ‘give mom permission’ wherever consent was needed,” said Laura. But fears of Katie getting swindled motivated Laura to follow through with guardianship. While Laura was away at a 5p- Society board meeting, Katie had let herself into the family home about the same time that Laura’s husband, Mike, pulled into the driveway. While Mike finished up a phone call in his car, a door-to-door magazine salesperson rang the doorbell. Katie answered the door and let the person into their home. While no harm was done, the experience was enough to motivate Laura to complete the guardianship paperwork. A more life-threatening situation propelled Nevada mom, Yolanda Strauss, to seek guardianship over her son Michael, who is now 25. Michael needed emergency surgery to correct severe scoliosis. His spine was creating pressure on his body that could have collapsed a lung or caused heart failure. When Yolanda and Michael went to get blood work prior to surgery, hospital administrators insisted Michael sign a consent form. Michael was unable to sign the form and the lab refused to do the bloodwork. Luckily Michael’s doctor intervened and was able to push the lab work and surgery through, but he insisted that Yolanda get guardianship for Michael to avoid this situation from happening in the future. How did parents feel about getting guardianship over their children? In the comments to Amy Severson’s facebook post, a few parents who had not yet been through the guardianship process expressed trepidation about taking away the rights of their children. But the parents I interviewed were all pleased with their decision to obtain guardianship. Some parents expressed frustration with the guardianship system generally. Ohio parents Ed and Lisa Saylor hated the fact that they had to drag their daughter Ariah, 18, through the court system. “Now we’re reporting to a judge,” said Ed, Lisa’ husband, who was disheartened about being monitored by the court simply for being a responsible parent. Did parents hire a lawyer to get guardianship? The process for obtaining guardianship is different in every state. Some states have very easy processes, others are more complex. The parents interviewed were evenly split in terms of whether they used an attorney represent them in the guardianship proceeding. For those who hired a lawyer, peace of mind that the process would be done correctly was cited most frequently. “I wanted to make sure the guardianship was iron-clad,” says Ohio mom Eileen Sherman, who hired a local lawyer to get guardianship over her daughter Heather, who is now 36. Laura Bruns also hired a lawyer and was satisfied with her decision. “It didn’t really come across my mind that I would do the guardianship on my own,” said Laura. “Even though I worked in a local courthouse, I didn’t know where to start.” According to Laura, the lawyer made the process relatively easy. But it’s been several years since Denise filed for guardianship and even she conceded that, with resources now available online, she would have at least researched filing for guardianship on her own. The Saylors, Yolanda Strauss and Amy Severson were among the families interviewed who filed (or are filing) for guardianship without the assistance of an attorney. While many of the families interviewed would have liked the guidance of a lawyer, for most, saving a considerable amount on lawyers’ fees was the underlying reason to go it alone. However, most of the families who filed on their own had some form of assistance, either from a friend or advocate or from a helpful clerk at the courthouse. Though most of the families got through the guardianship proceeding on their own, in many cases these families experienced more anxiety about the process than the parents who hired a lawyer. This often stemmed from misinformation, or not having a complete understanding of the process, technical terms or all the options available to them. On a functional level, how does guardianship work? Most of the parents found that once they got guardianship, nothing really changed and their children still very much participated in all decisions affecting their lives. Once the court approves your application, they give you a paper “order” signed by the judge that describes what authority you have over your child. Most parents reported taking the paperwork to doctors visits, school registration or meetings for government services, but many times don’t get asked for them. Even though the guardianship gives the parents final say on major decisions, all the parents interviewed have their children participate in those decisions. “We’re still giving the kids choices in life about most things,” says Denise Ladwig who, together with Kayla, is currently making a decision about a group home. Eileen Sherman’s daughter Heather now lives in a group home, which checks in with Eileen for major decisions. Though Eileen has full guardianship over all Heather’s personal and financial affairs, Heather still has the flexibility to make choices on her own, including taking money from her bank account to go on recreational trips like bowling. Laura and Beth found a work program they both liked, but Beth only wanted to work one day a week. So they both decided on a recreational day program for the other days. “She still has lots of choices to make in her life,” says Laura. Is it a good idea to not get guardianship? Without question, there is a movement to have people with intellectual and developmental disabilities maintain as many rights and choices as they can. While it is possible for parents of adult children with disabilities to get by without guardianship, careful analyses must be made as to whether this is the best, and safest choice for your child. Such an assessment typically involves determining your child’s ability to understand and retain relevant information, appreciate the nature and consequences of the most important life decisions they are making, and the ability to clearly express or communicate a decision. All of the parents, including those who described their children as being on the higher-functioning end of the CDC spectrum, described their children as being emotionally immature, overly trusting and susceptible to suggestion. These are primary reasons to justify guardianship, particularly if your child’s safety is a concern. Without guardianship, other people like caseworkers, hospital administrators and financial institutions will also be assessing your child’s capacity each time you deal with them. If your conclusion and theirs conflict, your child could be denied services because the other party believes your child does not have the capacity to consent. Parents who try to circumvent the guardianship process with a healthcare proxy granted by their child may find that very document called into question, since it’s debatable whether a CDC child has the capacity to consent to the proxy in the first place, at least not without undue influence. While foregoing guardianship may be appropriate for young adults with different disabilities, not getting guardianship is more likely the exception for CDC families, not the rule. What did Amy Severson decide to do? Ultimately, Amy Serverson filed for guardianship for Nellie before her 18th birthday, and she did it without the assistance of an attorney. “One of the women who works in our county court office is very knowledgeable and she can walk you through everything,” said Amy. Knowing that she had someone to lean on through the process made it easier to proceed with the guardianship on her own. What about you? Have you been through the guardianship process? Tell us about your experience in the comments below. 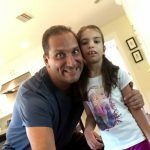 Stephen Furnari is a Florida attorney and the founder of Guardians Project, a low cost legal service that helps parents get guardianship for their children with disabilities easily and affordably. Stephen lives in Flagler Beach, Florida with his wife Kristi (who serves on the Board of the 5P- Society) and three daughters, including 8 year old Katie who is affected by the disorder. Connect with Stephen on Twitter @stephenfurnari. Your ticket for the: Is Guardianship Appropriate for Children with Cri du Chat?